Dr. Victoria L. Welch, D.C.
“Based on the MRI, my surgeon said I need surgery.” This is a sentence I have heard countless times over many years in practice. I would love to share some opinions and observations I have regarding this sentence and diagnostic imaging in general. Sometimes surgery is necessary. There’s no amount of neurological manual therapy, massage, nutrition, adjusting, or energetic awareness that can put a broken femur back together. However, situations like this are the exception, not the rule. The image below shows a number of common findings that often result in a patient “going under the knife.” The statistics listed here are “incidental” findings, meaning the person was experiencing NO symptoms of discomfort. (For example, 87% of people over 20 years old have a bulging disc but no pain.) And yet, when these findings are accompanied by discomfort, the abnormalities in the imagining are immediately assumed to be the cause. So if a bulge or tear is seen in the imaging, but many people with similar imaging are not in pain, then why assume your bulge or tear is causing the pain you’re experiencing? Example one: Two men entered within a week of each other with nearly identical low back injuries. Both acquired the injury during the warm up set of deadlifts, both with pain and numbness down the leg, both fit and in their mid 40s. The MRIs revealed moderate disc herniation at L5/S1. There was one stark contrast between these two men. One man was happy, the other pictured himself as a victim. The first improved substantially within 8 weeks. The second had no improvement with conservative care, surgery, still no improvement after surgery, and remained angry and victimized the whole time. These men were on two very different journeys and had two very different experiences, despite having similar imaging. I know they each had the experience they needed. However, it is interesting to ponder the influence of the mind on the body and the not-so-definitive findings of diagnostic imaging. Example two: I have had three individuals enter my office within the last year with hip replacement surgery already scheduled. All three had findings of arthritis on their MRI and had pain for several years. Using neurological manual therapy, some nutritional shifts, and improving energetic awareness, all three have been virtually pain free for greater than 9 months. The arthritis is still present, but the brain is no longer interpreting pain within the body. All three cancelled their surgery. 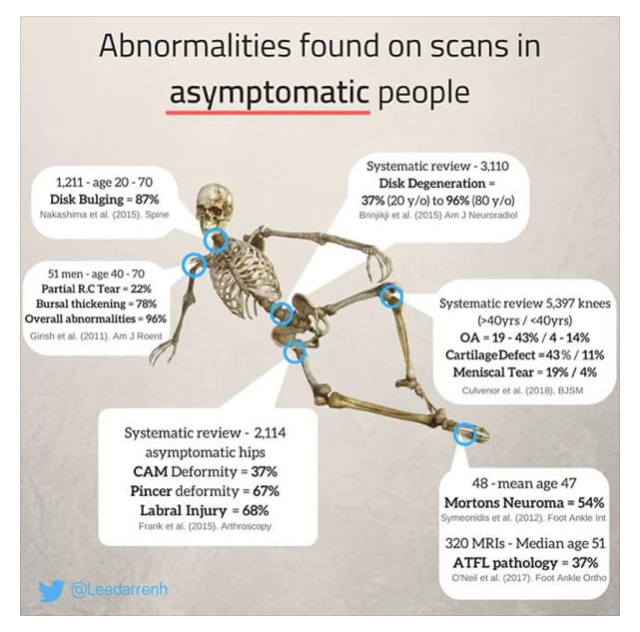 Again, imaging still showed the same abnormalities, but the individuals were no longer in pain. The work we do at DPPS is geared toward not only reducing this electrical signaling of pain to the brain, but also addressing the body and mind as a whole. We are complex, unique beings, and trying to define our experience in our bodies just by looking at an x-ray or MRI can be misleading. Luckily, we don’t work with the MRI, we work with client, listening to what your body is asking for and helping create positive change you can feel. Denver Pain and Performance Solutions is rated 5 stars over 98 reviews.